Prime Minister Julia Gillard has reshuffled her front bench, and there are now more women in her ministry. We already know that Finance Minister Penny Wong has just become a mother, so we’ll look at some of the other mothers of young families on the Labor front bench. Nicola Roxon has moved up from Health to become Australia’s first female Attorney-General. Many leading roles in government are now filled by women (our Governor-General is a woman named Quentin Bryce), which Nicola hopes is an encouragement to Australian girls. Nicola’s aunt Lillian was mentioned in Girls Names from the Top 100 of the 1930s. Nicola is married to Michael Kerrisk, who works for the Red Cross, and they have a six-year-old daughter named Rebecca. Tanya Plibersek has taken Nicola’s old role as Health Minister, and moves into the inner ministry from her former positions as Minister for Housing and Minister for Social Inclusion. Her parents are migrants from Slovenia, and Tanya is the first Slovene Australian appointed minister. Tanya is married to Michael Coutts-Trotter, director-general of the NSW Education Department, and they have three children named Anna (aged 10), Joseph (aged 6) and Louis (aged 1). Julie Collins has become a minister for the first time, taking on the portfolios of Community Services, Indignous Employment and Economic Development, and Status of Women. She is married to Ian, and they have three children named Lachlan, Andrew and Georgia. (Photo from Sydney Morning Herald, December 17 2011. 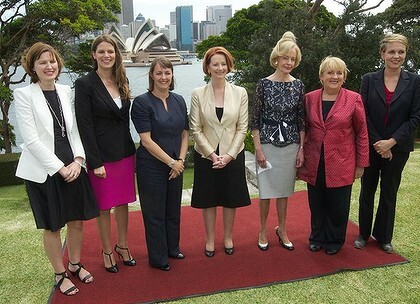 Julie Collins is on the far left, and Tanya Plibersek on the far right of the picture; Nicola Roxon is third from the left, standing next to Prime Minister Julia Gillard, who is next to Governor-General Quentin Bryce). February: Liberal Senator for South Australia Simon Birmingham and his wife Courtney Morcombe welcomed their first child, Matilda Esma. February: Federal Liberal MP Jamie Briggs and his wife Estee welcomed Scarlett Jeannine. Scarlett joins older siblings Henry and Elka. There were two other celebrity babies named Scarlett this year – Scarlett Mitchell and Scarlett Tander. October: Adelaide born to Labor MP Craig Thomson and wife Zoe Arnold; big sister Matilda. December: Matthew Ian born to Sunshine Coast Councillor Chris Thompson and wife Jane; big sisters Seanna, Ella and Mary. December: Alexandra born to Labor Senator for South Australia and Federal Finance Minister Penny Wong and partner Sophie Allouache.